"Bob lived in the big city. The city was very crowded." This charming picture book tells the true story of Bob Redman, a child growing up in New York City. Tired of the noise, the people, and the rushing around, Bob took shelter in the natural beauty of Central Park--where he covertly built a series of amazing treehouses, starting with a simple platform and growing more and more elaborate over time. He played cat-and-mouse with the park workers, who kept tearing down his houses, until he was finally caught. But his story ends with a happy surprise . . .
Shira Boss is a writer who lives on the Upper West Side of Manhattan, three blocks from Central Park. 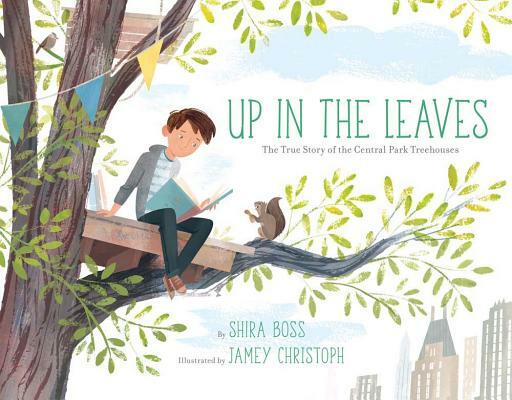 Up in the Leaves is her second book. She earned undergraduate and graduate degrees from Columbia University, including a master's in Journalism. When her Japanese maple tree needed pruning, several people suggested she call arborist Bob Redman. He said it was the smallest tree he had ever worked on (about four feet high, in a pot). Now they have two sons, two whippets--and many more trees. Connect with them at shiraboss.com. Jamey Christoph's illustrations have appeared in The New York Times, San Francisco Chronicle, and in several award-winning children's books, including Gordon Parks: How the Photographer Captured Black and White America by Carole Boston Weatherford (Albert Whitman). He works out of his 1920s home in Cleveland Heights, OH, with his crazy dogs, Owen and Jack.